End of support for Windows 7 is coming on January 14th 2020. This means that after this date there will be no further security and stability patches, and any vulnerabilities that can be exploited by hackers will cause you, your files, and your personal data, to remain vulnerable. Anti-virus software will not be able to act as a defence in this circumstance, so it’s crucial you upgrade to a newer version of Windows, which will usually mean Windows 10. But can you still get Windows 10 for free? During its first year it was offered as a free upgrade to all existing Windows 7 and Windows 8.1 customers. During this time many people upgraded to Windows 10 to test it, and then decided to roll back their PC to Windows 7. This was an option of the Windows 10 upgrade. If you were one of the people who upgraded to Windows 10 during this time, and rolled your PC back, then Windows 10 will already have been activated on your PC. 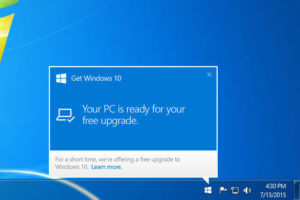 This means on the same PC, you can upgrade to Windows 10 again completely FREE. You can do this through the Windows 10 Media Creation Tool. NOTE: This will only apply to the PC Windows 10 was previously tried on, and not a different PC. For everybody else there are various options. If you’re not ready to purchase a new PC, copies of Windows 10 are available to purchase from the Microsoft Store. There are many stories online from people who say that if you perform a clean installation of Windows 10 using the product key that came with your Windows 7 or Windows 8 PC, that this key is accepted and Windows 10 activates fine. The product key is found on a sticker on your PC’s case, as seen in the image (right). Microsoft are not acknowledging that this workaround exists because if they have left this door open for users to upgrade for free, they still want to sell Windows 10 licences. If you want to try this, make sure you have a full backup of your Windows 7 (or Windows 8.1) installation using the System Image Backup tool, and you can find instructions on the link, and crucially, that you have a backup copy of all your files and documents, and copies of any software installers you will need to reinstall if it doesn’t work. You should also download a new installer for Windows 7 or Windows 8.1 just in case. Obviously this method is not supported and cannot be recommended, it needs to be undertaken at your own risk.